Christa and Martin Stosiek, owners of Markristo Farm in Hillsdale, N.Y., which the couple has been farming for the past 25 years. Hillsdale, N.Y. — If they ever get tired of what they’re doing, Christa and Martin Stosiek could become models for “farmer of the month.” With their blonde hair, blue eyes and three beautiful children, the Stosieks radiate the qualities you want from your farmer — familiarity with the land, hard work, and organic practices. The Stosieks have been farming Markristo Farm in Hillsdale for 25 years. The first few years they grew berries, “a failed experiment” as Martin says. “There’s not a lime deposit in this whole area,” he explains, which is why growing berries simply couldn’t happen successfully. Besides soil incompatibility, the truth is that Martin likes to till the soil, and to plant every year. So no more berries. Markristo Farm on route 23 in Hillsdale, N.Y. They farm on land that has been in the family since 1961. Last year, they bought Bridlewood Horse Farm, not far from their home in Hillsdale. It is a huge horse farm project, compatible with their childrens’ passion for horses. The Stosieks “grow everything except rudabagas.” There are a lot of vegetables with a primary concentration on salad and cooking greens. Additionally, they grow large quantities of cabbage for kimchi and sauerkraut, and edamame for processing. And early in the season, their bedding plants and flowers are what you’ll see at farmers markets. Their delivery route runs between Pittsfield and Rhinebeck. And they have distributors who take their products to New York City. Martin and Christa and their children personally work at the Great Barrington and Hillsdale farmers markets on Saturday mornings. Markristo Farm has been a member of Berkshire Grown since it was organized in the 1990’s. As the Stosieks were starting out, they found Berkshire Grown to be very helpful in finding clients. “They opened doors for us,” says Christa. The Stosieks also are members of NOFA NY, an organic farming organization. 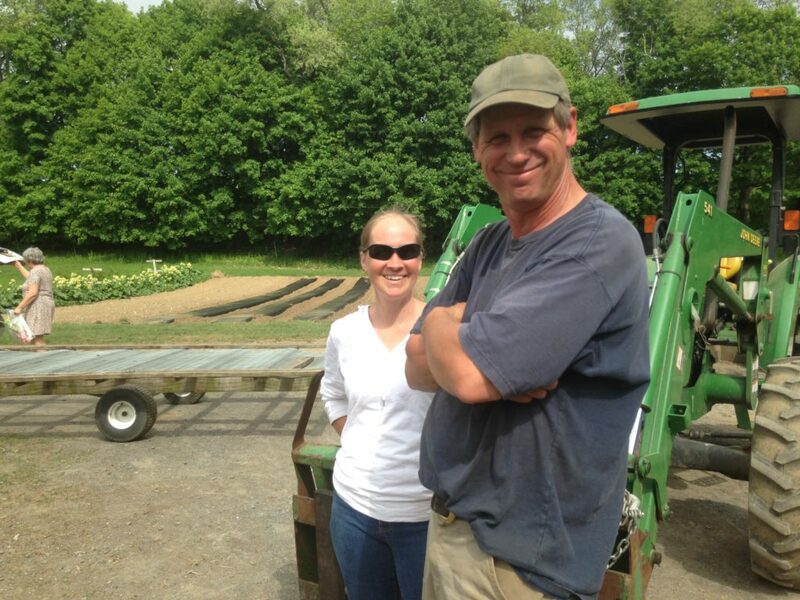 Through Berkshire Grown’s farmer mentoring program, Martin is helping new farmer, Jess Camp, of MX Morningstar Farm in Copake. “She’s very good. She knows what she’s looking for and asks a lot of questions,” he says. Martin will meet with her through the 2015 growing season. The output of the Markristo Farm greenhouse. There are a lot of new farms in Columbia County, and many of those are endowed by wealthy people who want to invest in the land. “This is the reality of organic farming that has been happening for the last 25 years,” says Christa. Martin would not discourage his children from becoming farmers, but Christa disagrees. “They’ll grow food, but who knows what they’ll end up with,” she says. She points out that today farmers tend to sell their land and get out. “And if you’re in Columbia County, the land is at a premium,” she adds. Markristo is an active mentor with the Columbia County Land Conservancy hookups. They send Martin out to evaluate farmland, information that then goes into their database. “I recently visited a place up the road,” says Martin, “that has 15 acres in hay. I’m going to do vegetables there.” They drove me over to that property that looks like a movie set on a sunny May afternoon. The Stosieks have purchased new land in Hillsdale. Currently, Markristo has three seasonal workers, two of whom live on the farm. For years the Stosieks were active in CRAFT, an organization that coordinated farmers and interns. The Stosieks have three children – Sarah is 18, Rebecca is 15, and Matthias is 11. Horses play a large role in the family’s life, although now Matthias has his own John Deere tractor. The Stosieks always welcome visitors to their farm. For those who would like to visit, mark your calendar for Sunday June 14 at 11 a.m. when the Berkshire Co-op has scheduled a visit to Markristo Farm. Martin concluded our interview by reiterating that after 25 years, he still loves being a farmer. I don’t know how many people feel that way about their lives, but it was refreshing to hear his words and see the smile as he said it.